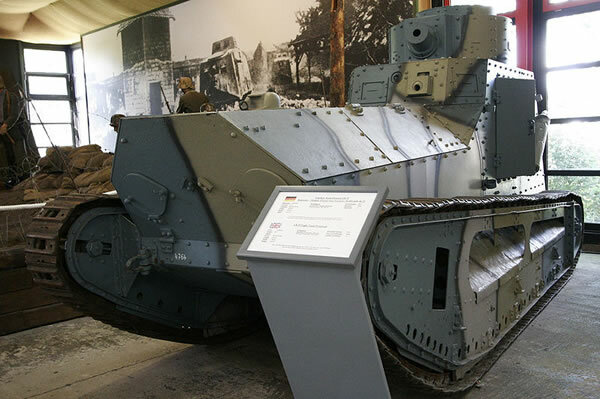 The German LKII Light Tank (Leichte Kampfwagen) was a prototype built in 1918 by J. Vollmer who had proposed that a large number of more lighter and less sophisticated tanks could swarm the larger and lesser numbered British MkI (and other similar more modern) Tanks. The LKII was better armoured and up gunned over the LKI. Both vehicles looking similar to the British Whippet Tank with the engine mounted in the front and were based on the Daimler car chassis. It was the LKII that was proposed for production, however the planned 580 vehicles were never built due to the 1918 Armistice. The vehicles design plans were later passed on to Sweden after the Armistice who built the vehicle in 1929 as the Strv M/21.